Yes we will. We’ve said we’ll scrap the Human Rights Act, which has put our police in the ridiculous position of trying to tackle the most serious crimes without putting the faces of the most wanted criminals on posters, and made it incredibly difficult for the government to deport people who they know to be threat. Instead, what we need is a modern British Bill of Rights which clearly sets out people’s rights and responsibilities, and strengthens our hand in the fight against terrorism and crime”. It is perhaps unnecessary for us to deal with the difficulties with Mr Cameron’s analysis in his answer. The point is that the Conservative Party appears to have selected this as the first question to respond to and that it is obviously seen as a vote winner. The Guardian’s “Liberty Central Blog” has a new series “Blogging the Bill of Rights“. The first piece is by Francesca Klug, under the title “Bill of Rights: What’s in a Name?” – which deals with the interesting history of opposition promises to introduce a “Bill of Rights”. The parallels between 1979 and 2010 are reinforced by the surprising presence of a promise to hold all party talks on a “possible bill of rights” in Margaret Thatcher’s manifesto. Meanwhile, there has been a consultation in Northern Ireland about bringing in a “bill of rights”. The Northern Ireland Office published a Consultation Paper in November 2009 and the consultation process closes on 1 March 2010. There is an interesting debate on the question “Would a Bill of Rights ensure a better future for Ulster?” in the Newsletter on the subject. In Australia there has been a wide consultation on the better protection of human rights, which has now reported to the Government and may lead to an Australian Human Rights Act. These two consultations might provide some ideas for a new Government wishing to have the widest public support for a new “Bill of Rights”. 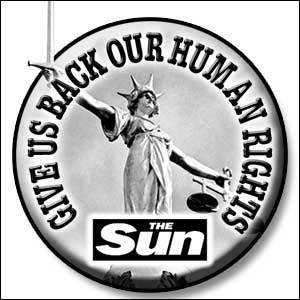 Leave a reply on "“Rights, Responsibilities and the Repeal of the Human Rights Act” (Continued) [updated]"